Last night, for the second week in a row, I went to the FMF Twitter pre-party! I engaged with tweets, asked a question or two, and even responded to at least one! Then…my eyelids do this thing called lowering and I’m just plain finished for the day. I said goodnight and honestly? I was sound asleep by 9:20! Kate Motaung, the hostess with the mostest, does an excellent job of getting everyone corralled and on-task! 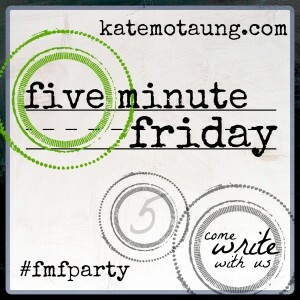 Five Minute Friday is in its fifth year (I think) and you can read all about it here. If YOU would like to try your hand at a free-write for five minutes, and you don’t have a blog, please feel free to use the comment box. I’d love to read how you feel or how you see this week’s word prompt. I enjoy being ALONE. And, I enjoy being ALONE at home. Our home is where I energize, where I’m fully charged and functional. 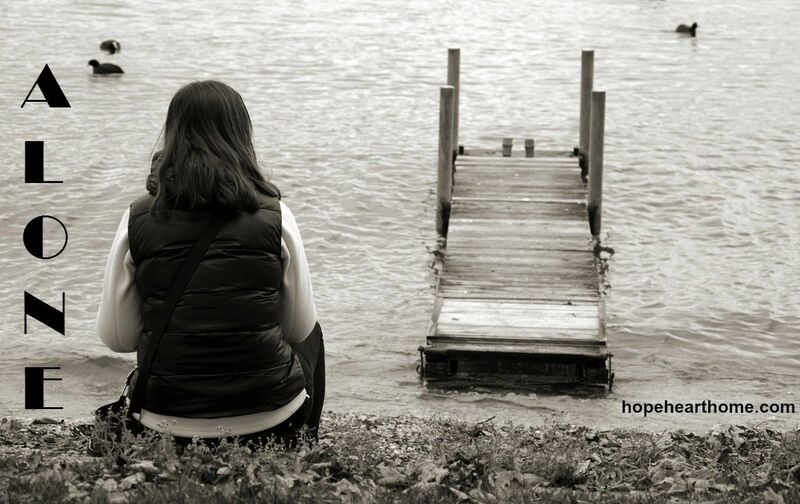 I have never been afraid of being alone, or staying by myself – ever! As a believer in the Lord Jesus Christ, I’m (actually) never alone. I have my Three Best Friends with me at all times: Father, Son, and Holy Spirit. Yes, I talk to them out loud when I’m alone! No, I’m not nuts! When David was alone in EinGedi, he wrote Psalm 63. Just because I enjoy being alone doesn’t mean I don’t enjoy being with people – because I do. One-on-one is great, a small crowd of four is fine too. But in a crowd? I find a place to sit alone and hope I meld into the background! How about you? Do you like to be alone? If you want, write about it in the comments. I have yet to join in on the Twitter party – but really enjoy reading posts on Friday. It sounds like fun – I just don’t stay up late enough, my eyelids usually start drooping around 8ish. Scary but true. I love your statement “Just because I enjoy being alone doesn’t mean I don’t enjoy being with people.” You would think I’d have a better handle on the introvert/extrovert thing – but I’ve just recently learned that I, too, am an introvert. I love to be around people, but I don’t like being the center of attention, and I have come to realize that I need some alone-time to re-energize. Apparently it’s kind of a writer trait. Thankful to be your neighbor at FMF – I hope you have a wonderful weekend! Janet, next week, at 7:30 just come to the party for 30 minutes. YOU CAN DO THIS!!! YOU pop in here any ole time, Jen!!! Alone…I was alone with someone for many, many, many years. I was always running away…my home wasn’t my sanctuary. Your home should always be your sanctuary. It should be your safe place. My Sister Susan knows her home is her sanctuary. It always has been since she moved to N.C. years ago. As I remember I felt safe there too. And it doesn’t matter what your home is: how big, how small…that is not the issue here. My son’s home is big but it is home! It is safe and there is laughter there and the kids want to be there even the 21 year old daughter who has her own home! My two daughters’ homes are home. Safe places for them and their kids. Our hearts should be a safe place sanctuary “home”. I too talk out loud to Abba, Jesus and Holy Spirit. And I just talk about life, sometimes good, sometimes bad, sometimes tears. And when you have Jesus Christ as Lord and Saviour you should always feel at home in yourself! I’m still working on that part! But I am getting there. Alone, there are good parts of being alone. In all things we SHOULD rejoice! So great to see you at FMFParty last night and enjoyed your post today! Thanks, Holly, looking forward to spending some time with you! I love solitude. And, like you, I’d rather be alone than be with someone (anyone) and feel lonely. Thank you for the reminder that as Christians we are never truly alone. We (I) may feel that way at times but it isn’t truth. Love you. Hope you have a happy weekend! Shelby, sometimes it does feel like we’re alone and that’s when we MUST remind ourselves of who we have beside us in Christ! I LOVE being alone. Grew up an only child, so I’m used to it – but then I had the big family and I was never. alone. again. Last night, I felt very alone at that Twitter party. And then I realized no one but those following me could see my tweets! ACK! So, I wrote about it. Your the second post I’ve read that shared that Kari Jobe video and song. David was good at sharing his words in the Psalms. As a poet, I’ve come to really appreciate the Psalms. And thank you for reminding me it’s about quality and not quantity. how funny that you enjoy being alone. I rarely could say that growing up. My first Christmas with my in-laws felt so empty because my husband’s family is a family of 4. Mine was a family of 7. I always want to have people around. Goodbyes are terrible. Death is the worst offense. We were never meant to be separated. Still, in my post, I highlight that we need both alone time with God and fellowship with others. Tammy, I’m not weird about being alone or anything! And, I can do well around groups of sane people!!! Loved your Elvis video! Good and sweet fellowship with the Lord often comes in my times of deepest aloneness (when I’m smart enough to remember to call out to Him, that is). Thank you so much for this reminder that I am never truly left to myself, no matter what things look like or how I feel. Marie, I really enjoyed your ALONE. Hope you read my comment! Ah, I loved reading your ALONE post. You are so on point. We always have our three best friends and no, we aren’t nuts. What would we do without Them, Christina? Thanks for visiting. I like to be alone, sometimes. I get energized being around people. But even I need some alone time. When I am alone, I do like to write. Everyone needs time and space just to be. Jenn, YES to trying. It begins at like 7:30…with a small group but it is fun. I’m going to look for you next week! There is something to being alone that can very energizing. I also like that time but I also need to be intentional in reaching out to others to maintain my real life connections. Glad you made the Twitter party!!! Intentional in reaching out – Oh! Mary, I do to. Thanks for coming by! I so enjoyed your post. I love being alone at home too! There’s something peaceful about knowing I’m in a place I love and my hubby and boys are away. 🙂 I can focus on writing and getting a few things done around the house. I did some of that below the surface connecting today – had lunch with three really wonderful girlfriends! Thanks for stopping by Jeanne. Very similar to what I wrote on Marie’s blog….but alone time can be a wonderful thing, but I don’t want to dwell there forever. I don’t want to isolate myself and seek comfort in the known, in the comfort, of stepping back and drawing away from community. Because we’re designed to be in community, and we need each other to do this crazy thing called life. We need each other and we need God. You are right on every account. Let’s hold one another accountable.